To Dog With Love: Win an HGTV Dream Home! Win an HGTV Dream Home! Here's a chance to win an amazing dream home for you and your (pet) family! I guarantee there will be plenty of space for your pets to get the zoomies! 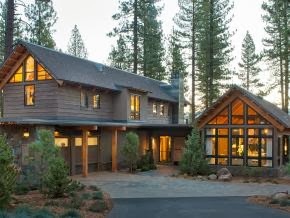 The 2014 HGTV Dream home is a 3,200-square-foot dream home located in Truckee, Calif., minutes from the year round recreation destination of Lake Tahoe. You can enter to win a grand prize package valued at almost $2 million that includes the fully furnished home as well as a 2015 GMC Yukon Denali and $250,000, courtesy of Quicken Loans. The home is amazing and even features a special custom pet niche. Take a look at this brilliant use of an otherwise under-used space! During the giveaway period, which runs until Feb. 14, 2014, you can enter twice online per day: once at HGTV.com and once at FrontDoor.com. HGTV Facebook and Twitter fans can elect to receive ongoing updates and new details, and fans can sign up for daily e-mail reminders at HGTV.com. Odds of winning the sweepstakes depend on the number of entries. Official rules can be found at hgtv.com/dreamhome. Still deciding whether to enter? Take a look at this insanely awesome home where modern mountain design meets livable luxury! heehee! I was drooling over every single room! Wow wow wow. Have a tremendous Thursday. Nice place, but we wouldn't know what to do with a home there except to sell it. thanks so much for posting!!! I kept meaning to enter and forgot! OMG I LOVE THAT HOUSE!